Low back pain is an ache or discomfort in the area of the lower part of the back and spinal column. The lower spinal column has many small bones and muscles that surround and protect the spinal cord and nerves. Low back pain is common and affects most adults at some point in their lives. Low back pain in more common in older adults. You should call your doctor if you have back pain and a history of cancer or osteoporosis. You should also call if you have a history of recent infection, steroid use, or IV drug use. You will be asked about your symptoms and medical history. A physical exam will be done. The exam will focus on your back, hips, and legs. The doctor may test for strength, flexibility, sensation, and reflexes. Bed rest is not generally recommended. It may be suggested for no more than 1-2 days in those with severe pain. Certain activities may be restricted for a period of time and then resumed as soon as possible. Recovery time may be shortened by staying active and exercising. Cognitive behavioral therapy is often used to help manage chronic pain and stress. It is a form of talk therapy that may be done individually or in a group. A therapist will help you identify negative thoughts and teach you to unlearn these thought patterns. You will also learn new, helpful habits to manage your pain with minimal disruption to your life. Only a small number of people need surgery. It may be needed if nerve problems develop or other treatments do not provide relief. Common procedures are discectomy , laminectomy , and spinal fusion . Acute low back pain. EBSCO DynaMed Plus website. 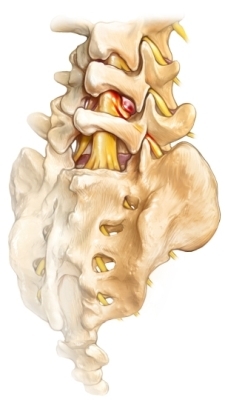 Available at: http://www.dynamed.com/topics/dmp~AN~T114958/Acute-low-back-pain . Updated October 25, 2017. Accessed November 15, 2017. Chronic low back pain. EBSCO DynaMed Plus website. Available at: http://www.dynamed.com/topics/dmp~AN~T116935/Chronic-low-back-pain . Updated June 30, 2017. Accessed November 15, 2017. 9/16/2008 DynaMed's Systematic Literature Surveillance http://www.dynamed.com : Kalus SM, Kornman LH, et al. Managing back pain in pregnancy using a support garment: a randomised trial. BJOG. 2008;115:68-75. 12/16/2008 DynaMed's Systematic Literature Surveillance http://www.dynamed.com : Furlan AD, Imamura M, et al. Massage for low-back pain. Cochrane Database Syst Rev. 2008;CD001929. 1/30/2009 DynaMed's Systematic Literature Surveillance http://www.dynamed.com : Yuan J, Purepong N, et al. Effectiveness of acupuncture for low back pain: a systematic review. Spine. 2008;33:E887-E900. 2/17/2009 DynaMed's Systematic Literature Surveillance http://www.dynamed.com : Bigos SJ, Holland J, et al. High-quality controlled trials on preventing episodes of back problems: systematic literature review in working-age adults. Spine J. 2009;9:147-168. 2/17/2009 DynaMed's Systematic Literature Surveillance http://www.dynamed.com : Chou R, Fu R, et al. Imaging strategies for low-back pain: Systematic review and meta-analysis. Lancet. 2009;373:463-472. 2/24/2009 DynaMed's Systematic Literature Surveillance http://www.dynamed.com : Sahar T, Cohen M, et al. Insoles for prevention and treatment of back pain. Cochrane Database Syst Rev. 2009;(1):CD005275. 9/2/2009 DynaMed Systematic Literature Surveillance http://www.dynamed.com : Urquhart D, Hoving J, et al. Antidepressants for non-specific low back pain. Cochrane Database Syst Rev. 2009;(3):CD001703. 12/17/2010 DynaMed's Systematic Literature Surveillance http://www.dynamed.com : Andersen LL, Christensen KB, et al. Effect of physical exercise interventions on musculoskeletal pain in all body regions among office workers: aone-year randomized controlled trial. Man Ther. 2010;15(1):100-104. 10/21/2011 DynaMed's Systematic Literature Surveillance http://www.dynamed.com : Chan CW, Mok NW, et al. Aerobic exercise training in addition to conventional physiotherapy for chronic low back pain: a randomized controlled trial. Arch Phys Med Rehabil. 2011;92(10):1681-1685. 11/29/2011 DynaMed's Systematic Literature Surveillance http://www.dynamed.com : Gatti R, Faccendini S, et al. Efficacy of trunk balance exercises for individuals with chronic low back pain: a randomized clinical trial. J Orthop Sports Phys Ther. 2011;41(8):542-552. 11/25/2013 DynaMed's Systematic Literature Surveillance. http://www.dynamed.com : Wegner I, Widyahening IS, et al. Traction for low-back pain with or without sciatica. Cochrane Database Syst Rev. 2013;8. 3/24/2015 DynaMed's Systematic Literature Surveillance. http://www.dynamed.com : Jarvik JG, Gold LS, et al. Association of early imaging for back pain with clinical outcomes in older adults. JAMA. 2015;313(11):1143-1153. 12/14/2016 DynaMed Plus Systematic Literature Surveillance http://www.dynamed.com/topics/dmp~AN~T910282/Counseling-and-education-for-chronic-low-back-pain : Cherkin DC, Sherman KJ, Balderson BH, et al. Effect of mindfulness-based stress reduction vs cognitive behavioral therapy or usual care on back pain and functional limitations in adults with chronic low back pain: a randomized clinical trial. JAMA 2016;315(12):1240-1249. 5/23/2017 DynaMed Plus Systematic Literature Surveillance https://www.dynamed.com/topics/dmp~AN~T115166/Sciatica : National Guideline Centre. Low back pain and sciatica in over 16s: assessment and management. London (UK): National Institute for Health and Care Excellence (NICE); 2016 Nov 30. 18 p.